I frequently have the bite-size sushi for lunch as bread tends to make me fall asleep. 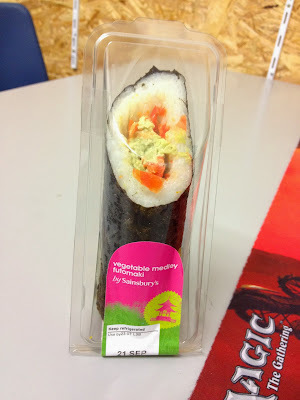 When hinting for this in Sainsbury's and being disappointed that they didn't have a veggie sushi for me (not refrigerating fish sushi makes veggie safer) I spotted a few of these futomaki which were. These did however have wasabi paste in them so I bought two large innocent fruit drinks just in case. I know this is essentially just a larger sushi roll, but the experience and tastes were very different. For one the wasabi wasn't too powerful but did come across as the main flavour and the smaller, pepper looking things added a crunchy touch. The rice was good and cooled the spiciness and the leaves were not hard or dry like I worried they may be. This is a perfectly good alternative to the little sushi box, and one that I'd happily buy again - maybe alongside the sushi box for a bigger meal or extravagant snack.